We're just about to load up all the changes in the Waiver Draft here today, thanks to everyone for your participation in the week. I know everyone has some very varying schedules, so I'm glad we weren't pressed too much for time to get it all done, allowing for some time on Sunday to get the bonus round done. Now, the start of all that shifting of players begins, so if I'm a little late getting everyone in, that just means all the stats from tonight's games will be delayed. Of course, I should get it all done today. First things first... the weekly review! The Winnipeg Jets were a bit of a question mark in the first few weeks of the season, everyone was wondering what had happened to the team that we were beginning to see at the end of last season. Well, I think they've finally shown up and man, are they flying! Blake Wheeler narrowly edged Mark Scheifele for the Player of the Week nod, as the two linemates were on fire in Week Nine, finishing with 10 and 9 points, respectively. The captain, Wheeler, earning the nod in the end, his second career hockey pool Player of the Week. Wheeler played in four games this week and only had points in three of those games, believe it or not. On Monday, he started off the week well with a goal and a pair of assists against Minnesota, but followed that up by being shutout by the Avalanche on Wednesday. He bounced back with a trio of assists against Vegas on Friday and capped it all off with a goal and a trio of assists against the Senators last night, bumping himself to the head of the pack with his big game. This now brings the 31-year old's totals up to 7 goals and 35 points in 27 games, good enough for 6th overall in pool scoring, to date. Wheeler is only 4 points out of the overall points lead in the hockey pool, which should make him a certain lock for some premier honours, including a spot on the Central Division All-Star team in February. This is all very good news for Grant, who managed to scoop up the Jets forward in the 3rd round of the draft, 56th overall, making him into a huge bargain pick. Wheeler made up one-third of his points in the week, which was a huge help, as Grant's team remains in the super-competitive top 10, currently 9th, 15 points back of the money. Oh, further to the note about Wheeler's second career Player of the Week nod... his first nod was way back in the 2012 season, Week Twenty, to be exact. It was a very good race at the top of the weekly standings in Week Nine, as the points were still flying around on Sunday and nothing was quite settled until the final buzzer went. Six teams all surpassed the 30-point mark in the weekly scoring and all of them were in the top half of the standings, making things pretty difficult for the rest of the pool, even if we were swapping players and they go active this week. In the end, it was Chris who finished atop of it all, finishing all alone with 35 points and taking his first Mover & Shaker title. Chris' team had a very good even attack on the hockey pool this week, as only two players failed to get points, one via injury, but the rest was very good across the board. 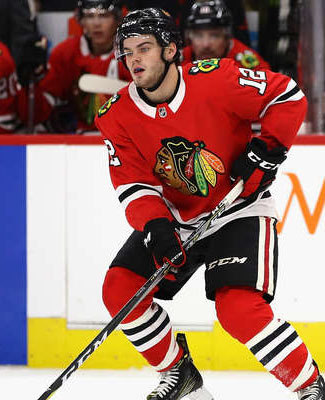 Leading the way for his team was Chicago rookie Alex DeBrincat and Los Angeles number one Jonathan Quick, as they both finished with 6 points each. Chris may have been owed that big week by Quick, as he has found his team out of the goalie survivor pool recently. Also having a good week for the newly minted Mover & Shaker were Aleksander Barkov of the Panthers with 4 points, as well as Brandon Dubinsky of the Blue Jackets, Derek Stepan of the Coyotes and rookie Thomas Chabot of the Senators, all finishing with 3 points each. I don't have any documentation on this, but I don't believe this is the first time that a player on a Mover & Shaker blog post that has been dropped that week in the Waiver Draft (Dubinsky), I'm sure that's happened at least once before. A nice sending off, indeed. With how tight the top half of the standings has been, Chris' big week was only good enough to move his team up a couple of spots in the standings, moving from 10th to 8th, which wasn't exactly the biggest gain in the standings, but it still works. Closing the gap on the money is certainly important and now with some flesh legs being inserted into his lineup, it will certainly be more competitive down the stretch. Now that the first 9-week segment is over, I can tell you that Chris' team was 16th in forwards scoring, 10th in defense and then 1st in goalie points, pointing towards his obvious strength this season and allowing the shock to settle in, that he is already out of the goalie survival pool. Being tied for 18th in goal scoring is probably one of the biggest reasons why his team hasn't been in the money spots since Week Four, as most teams need all three positions firing at the same time to succeed. As competitive as the top of the weekly standings were, it was just as close, if not closer, down at the bottom of the weekly scoring. This week, we have to employ the tie-breaking procedures, as both Derek B. and Wes were down at the bottom of the pile in Week Nine, finishing with only 13 points, while Steve managed to get that extra point to steer clear of this tie-break. First tie-break... least amount of goals becomes the Basement Dweller. And by a margin of 9-3, Derek B. stays clear of the Basement Dweller, giving the sleeping bag and the lantern to Wes, as he becomes the third team this season to earn his second Dweller nod of the season in nine weeks. Wes' team was nearly abandoned by his forwards, as only Jack Eichel and Ryan Spooner were the only forwards to pick up points, while the team was led by both Dustin Byfuglien and Zach Werenski, who each had 3 points. Wes' goalies, Jacob Markstrom and Cam Talbot, each had a win and that rounded out all the players that picked up points for his team in Week Nine. The rough week saw his team drop back a couple of spots, from 19th to 21st, but he was able to snag one of the top forwards in the Waiver Draft and also a pretty good minute-eating defenseman as well, so there are some improvements on the way for his team. Well, it's going to be hard to keep Brian down for too long, as his team jumped ahead and opened a lead in Week Nine, but that's what the Waiver Draft is for, right? Brian leapfrogged over Dale B. in the week and ran ahead by 10 points, while Jeremy still sits in 3rd and Stuart also got a big jump too, tying himself with Jeremy, both teams only 1 point back of Dale B.. Wilton nestled in tight in Week Nine, as his 5th placed team is only 3 points back of 2nd place, while Kristy & Don fell off a little, but are only 5 points back of 2nd. With all the changes in place, this race is going to get crazy. All of these teams, not to mention Benson and Chris, who aren't very far away either, are going to be making some pretty good pushes in the next nine weeks, barring some massive injuries or any other unforeseeable issues. Despite having 236 minutes worth of action this week, about four starts, Cam's team was unable to register a win from either Jake Allen of the Blues or Ryan Miller of the Ducks and he becomes the latest team to fall out of the goalie survivor pool in Week Nine. So, now we're only left with Jeremy, Wilton, Mike and Grant in the survivor pool and Wilton was the only one of the four to make a Waiver Draft claim for a goaltender, picking up Malcolm Subban of the Golden Knights to help cement his chances at a mini-game win. Amazingly, we are now at the same spot in the survivor pool, four teams, as we were at Week Nine last season. After Week Nine in the 2016 season, we did have six teams left, so I guess there is that, it's not exactly a record this year, but it has still been a good mini-game, to date. Holy cow! I would start with the leaders, you know, being the end of the segment and all, but I think it is definitely worth noting that Kristy & Don's team had the bottom fall out of their club in the plus/minus department, setting a record for the worst week in the mini-game, as they suffered a -27 in Week Nine. They opened the week in 7th place in the pool, 22 points back of the leader, but then Week Nine happened and they dropped down below even, dropping them down to 18th, 49 points back. Yikes! With the move into 1st place in the overall race, Brian leaped up to 1st place in this mini-game as well, jumping both Dale B. and Steve in the process, now sitting at +40, 2 points better than Dale and 5 better than Steve. This still remains close and we've now seen how much of a disaster week can actually happen in this pool, so we can all hope that it doesn't happen to our team in the future. If you missed the post earlier this weekend, the NHL has now opened up voting for the captains of the divisional All-Star teams for their 3-on-3 tournament. You can go and vote for your players to captain their respective divisional team and maybe even win a trip down to Tampa Bay to watch the game as well. You can submit up to 10 votes a day and if anyone has a Central Division player in need of some votes, I don't have any in that division anymore, so I would be willing to sell my vote to you for a fair price. No records were set in Week Nine in either the most or the least penalty minutes, but Stacey M.'s team was gooning it up the most, finishing atop of the weekly standings with 24 minutes through the last seven days. Her team still is the Lady Byng front-runner as the team with the least amount of minutes, not even hitting triple-digits yet, finishing with only 98 minutes in penalties. Wes' team still holds the lead for the overall goon title, finishing with 216 minutes through the first nine weeks and his team holds a 31-minute lead on Brenda & Seward's team. Those two teams are the two teams, far and away, the leaders. Wes dropped Radko Gudas in the Waiver Draft, taking one of his top guys away from the race, while the duo didn't make any drastic changes to their goons. Clayton finished off the first segment of the regular season in the lead in the non-existent rookie pool, finishing with 44 points, 6 points clear of Cam's team. Clayton disposed of one of his rookies in the Waiver Draft, as did Cam, so they are both heading into the second segment with a pair of very good rookies this season. There were a number of good rookies picked up in the Waiver Draft in Week Nine, going active later today, in Yanni Gourde of the Lightning being taken by Troy, Jesper Bratt of the Devils taken by Ryan, Alexander Kerfoot of the Avalanche taken by Stacey M. and Jan Rutta of the Blackhawks taken by Grant. This race could still be interesting by the end of the year for bragging rights, at best. Well, the pool wasn't doing so bad through Week Eight, but it really didn't like Week Nine so much, indicating that we really needed the new players in the Waiver Draft to activate and restore some of these scoring numbers. Week Nine was the 2nd-worst week for points per NHL game this season and it looks like it had more to do with the lack of goaltending minutes this past week, we didn't get as many starts or appearances as we would have liked and that hurt the pool, as a whole. Thankfully, we've made seven changes in the crease in the Waiver Draft, so these numbers should start to improve drastically. Good news for the Vegas Golden Knights, it appears that Marc-Andre Fleury is ready to rock and roll, as he has reportedly cleared the concussion protocol on Sunday and now it will be a matter of getting game-ready, which the team's management suggests could be as soon as the end of this week. We'll know pretty well when Fleury is ready to go, when Maxime Lagace gets sent down to the minors this week. That will be the sure sign that Fleury is ready. This is good news for Scott B., as his team kept Fleury through the Waiver Draft, and this will be a big gain, as he tries to get his team out of the basement with his pickups last week. He opens the week with a ##-point deficit behind the 24th placed team belonging to Eric. Nashville Predators forward Ryan Johansen collided with teammate Kevin Fiala in Saturday night's game against the Ducks in the 2nd period and wasn't able to return to the contest. The team did not say what kind of injury that Johansen had suffered quite yet, but we should hear quite soon, as to whether or not he'll be able to dress tonight, when the Predators host the Bruins. Not great news for Brian's team, as his team is in the midst of the money chase through Week Nine. Johansen hasn't exactly been dominant this season with only 17 points in 26 games, but he has been a reasonable contributor for Brian's team down under. We'll have to wait and see how long the centre is out for later on today. The Winnipeg Jets were without forward Kyle Connor on Sunday night, as the rookie forward was held out of the lineup with a minor lower-body injury. Connor is considered to be day-to-day and the coaching staff doesn't believe that the injury is too serious. Connor has been quite good for the Jets in his first full season with the club, picking up 17 points in 21 games, missing some time early to a demotion to the AHL out of camp, but bouncing back in fine fashion. For Eric, this is his second year with Connor out of the draft and there was plenty of concern in the first week or two with his demotion, that he might end up being a drop in the Waiver Draft, but that hasn't been the case. Connor has been one of his best players, but on a 24th place team, that might not be saying too much.